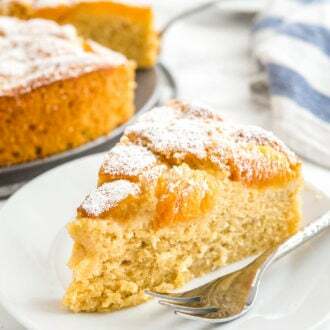 Apricot Cake is so easy to make from scratch! This simple but so flavorful cake is topped with fresh apricots and is perfect for summer entertaining. Preheat oven to 350°F (180°C) and grease the bottom and sides of a 9-inch springform pan with baking spray or butter. Set aside. Using a food processor or immersion blender puree half of the apricots with the lemon juice and set aside. Quarter remaining apricots and set aside. In the bowl of a stand mixer fitted with the paddle attachment cream butter and sugar together at medium-high speed until pale and fluffy, about 4-5 minutes. Add eggs, one at a time. Then add vanilla extract and beat until combined. In a small bowl combine flour, baking powder, cinnamon, and salt. Add to the mixture and beat until just combined. Add pureed apricots to the batter and beat until just combined. Transfer batter to the prepared springform pan. Distribute the quartered apricots evenly on top of the batter and bake for 55-60 minutes or until a skewer inserted in the center comes out clean with only a few crumbs attached.